With Page Automation Managed Document Services (MDS), you can optimise your entire output set-up. By providing a comprehensive bundle of services to streamline your output management, we can reduce the workload of your IT department and cut your environmental impact. No matter what size your company is, you will gain from Page MDS. What is Page Automation MDS? 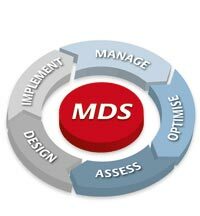 MDS stands for Managed Document Services. It is superior to Managed Print Services (MPS) (Managed Print Services) because where MPS only focuses on output, MDS optimises your entire document output process – from capturing to archiving, workflows to security and environmental impact. Page Automation MDS uses a process of Assessment, Optimisation and Management to precisely identify your document output costs. We highlight where time and resources are wasted before creating a tailor-made environment to reduce your overall costs and impact on the planet. What’s more, by offering a wide range of services from one single source, Page Automation MDS eliminates the frustration and time-wastage of dealing with numerous vendors. Ultimately, Page Automation MDS can streamline your output management, reduce your IT department’s workload and also cut the environmental impact of your printers and MFPs. No matter what size your company is, you will gain from Page Automation MDS. Why choose Page Automation MDS? Page Automation MDS is the perfect partner for more efficient, economical and environmentally-friendly document output. It is a total solution that optimises your entire output process from hardware to workflows and staff productivity – regardless of what brand your devices may be. Page Automation printers, copiers and multifunctional devices are renowned for their exceptional reliability and economy. Page Automation software applications are your guarantee for lean and secure document processes. Page Automation has always focused on environmental protection and the preservation of economical resources when developing its products and technologies. With Page Automation, you enjoy all the expertise you need from a highly dependable service partner. Page Automation MDS is not just for large, international corporations. Our services are of great benefit to small and medium-sized companies. We are confident that Page Automation MDS will help to achieve significant cost reductions in your company, too. And with Page Automation, you enjoy all the expertise you need from a highly dependable service partner. Page Automation MDS optimises your entire document environment in five flexible, carefully designed phases. Customised to the size and unique requirements of your business, our process starts by identifying weak spots in your current infrastructure before seamlessly implementing solutions to cut costs and improve ongoing performance. A detailed data analysis of your current document output. Provides a report highlighting areas for waste reduction, workflow improvements and reduced environmental impact. Professional project management and highly qualified technicians ensure minimum disruption – from installation to training. Hassle-free maintenance and support takes care of everything you need. Includes automatic replenishment of consumables. Continual improvement of your print environment – optimised through ongoing assessment, reports and consultation. Reduced costs. Less environmental impact. More security. Increased employee productivity and satisfaction. Page Automation MDS has many practical advantages. Reducing the use of consumables such as paper and toner. Lowering service and support costs. You can set up binding print policies that determine when colour printing systems may be used, thereby avoiding unnecessary costs. Because the age and lifetimes of the systems are all known, cost drivers can be easily identified and removed simply by exchanging devices. Optimisation: INCREASED PRODUCTIVITY AND EMPLOYEE MOTIVATION. Increasing productivity through optimised workflows, reduced down-times and minimising the workload of IT staff who look after your fleet. State-of-the-art output solutions make document management faster and more effective: eg automated capture, distribution and archiving of regular documents like bills, purchase orders or insurance applications. Optimised device management saves time and reduces staff frustration: It decreases the time spent waiting for documents due to overuse and ensures proximity to the work area where employees need it most. Hassle-free: PROFESSIONAL, CUSTOMISED AND FROM A SINGLE SOURCE. With only one point of contact, MDS saves you trouble and manpower. We supply you with everything you need for every printer and multifunctional device, regardless of the brand. We take on all maintenance and repair services, both for our own printers and copiers as well as those of other manufacturers. Remote Monitoring system: We recognise deviances in the functioning of a device and react quickly whenever needed without having to be on-site. Eco-friendly: IMPROVED ENVIRONMENTAL AND SUSTAINABILITY MANAGEMENT. Page Automation MDS helps reduce your energy and resource consumption, improving your balance sheet ecologically as well as economically. We improve environmental sustainability through economic software applications and ECOsys technology. By consolidating your hardware and using electronic data management, you take a big step forward in energy efficiency. We can advise on the conversion of your fleet to energy-saving printers and copiers that will make an even larger difference to your energy costs. Other services include: Using recycled paper, developing company-specific disposal concepts and implementing a company “print policy” that requires employees to be be more ecologically considerate. Secure: IMPROVED MONITORING AND PROTECTION OF DATA AND DOCUMENTS. No matter what line of business you are in, your documents and network hold vital information. You have an obligation to protect your client’s documents and your customer’s private data.Page Automation MDS offers additional security through authorised access to devices and networks, as well as by keeping tighter controls on what is being printed.